Bishop of Ratisbon (972-994), born about 934; died at the village of Pupping in upper Austria, 31 October, 994. The name Wolfgang is of early German origin. St. Wolfgang was one of the three brilliant stars of the tenth century, St. Ulrich, St. Conrad, and St. Wolfgang, which illuminated the early medieval period of Germany with the undying splendour of their acts and services. St. Wolfgang sprang from a family of Swabian counts of Pfullingen (Mon. Germ. His. : Script., X, 53). When seven years old he had an ecclesiastic as tutor at home; later he attended the celebrated monastic school on the Reichenau. Here he formed a strong friendship with Henry, brother of Bishop Poppo of Würzburg, whom he followed to Würzburg in order to attend at the cathedral school there the lectures of the noted Italian grammarian, Stephen of Novara. After Henry was made Archbishop of Trier in 956, he called his friend to Trier, where Wolfgang became a teacher in the cathedral school, and also laboured for the reform of the archdiocese, notwithstanding the enmity with which his efforts were met. Wolfgang's residence at Trier greatly influenced his monastic and ascetic tendencies, as here he came into connection with the great reformatory monastery of the tenth century, St. Maximin of Trier, where he made the acquaintance of Ramwold, the teacher of St. Adalbert of Prague. After the death (964) of Archbishop Henry of Trier, Wolfgang entered the Order of St. Benedict in the Abbey of Maria Einsiedeln, Switzerland, and was ordained priest by St. Ulrich in 968. After their defeat in the battle of the Lechfeld (955), a victory gained with the aid of St. Ulrich, the heathen Magyars settled in ancient Pannonia. As long as they were not converted to Christianity they remained a constant menace to the empire. At the request of St. Ulrich, who clearly saw the danger, and at the desire of the Emperor Otto the Great, St. Wolfgang, according to the abbey annals, was "sent to Magyars" as the most suitable man to evangelize them. He was followed by other missionaries sent by Bishop Piligrim of Nassau, under whose jurisdiction the new missionary region came. After the death of Bishop Michael of Ratisbon (23 September, 972) Bishop Piligrim obtained from the emperor the appointment of Wolfgang as Bishop of Ratisbon (Christmas, 972). Wolfgang's services in this new position were of the highest importance, not only for the diocese, but also for the cause of civilization. As Bishop of Ratisbon, Wolfgang became the tutor of Emperor St. Henry II, who learned from him the principles which governed his saintly and energetic life. Poppe, son of Margrave Luitpold, Archbishop of Trier (1016), and Tagino, Archbishop of Magdeburg (1004-1012), also had him as their teacher. St. Wolfgang deserves credit for his disciplinary labours in his diocese. His main work in this respect was connected with the ancient and celebrated Abbey of St. Emmeram which he reformed by granting it once more abbots of its own, thus withdrawing it from the control of the bishops of Ratisbon, who for many years had been abbots in commendam, a condition of affairs that had been far from beneficial to the abbey and monastic life. In the Benedictine monk Ramwold, whom St. Wolfgang called from St. Maximin at Trier, St. Emmeram received a capable abbot (975). The saint also reformed the convents of Obermunster and Niedermunster at Ratisbon, chiefly by giving them as an example the convent of St. Paul, Mittelmunster, at Ratisbon, which he had founded in 983. He also co-operated in the reform of the ancient and celebrated Benedictine Abbey of Altach (Nieder-altach), which had been founded by the Agilolf dynasty, and which from that time took on new life. He showed genuine episcopal generosity in the liberal manner with which he met the views of the Emperor Otto II regarding the intended reduction in size of his diocese for the benefit of the new Diocese of Prague (975), to which St. Adalbert was appointed first bishop. As prince of the empire he performed his duties towards the emperor and the empire with the utmost scrupulousness and, like St. Ulrich, was one of the mainstays of the Ottonian policies. He took part in the various imperial Diets, and, in the autumn of 978, accompanied the Emperor Otto II on his campaign to Paris, and took part in the great Diet of Verona in June, 983. St. Wolfgang withdrew as a hermit to a solitary spot, now the Lake of St. Wolfgang, apparently on account of a political dispute, but probably in the course of a journey of inspection to the monastery of Mendsee which was under the direction of the bishops of Ratisbon. He was discovered by a hunter and brought back to Ratisbon. While travelling on the Danube to Pöchlarn in Lower Austria, he fell ill at the village of Pupping, which is between Efferding and the market town of Aschach near Linz, and at his request was carried into the chapel of St. Othmar at Pupping, where he died. His body was taken up the Danube by his friends Count Aribo of Andechs and Archbishop Hartwich of Salzburg to Ratisbon, and was solemnly buried in the crypt of St. Emmeram. Many miracles were performed at his grave; in 1052 he was canonized. Soon after his death many churches chose him as their patron saint, and various towns were named after him. In Christian art he has been especially honoured by the great medieval Tyrolese painter, Michael Pacher (1430-1498), who created an imperishable memorial of him, the high altar of St. Wolfgang. In the panel pictures which are now exhibited in the Old Pinakothek at Munich are depicted in an artistic manner the chief events in the saint's life. The oldest portrait of St. Wolfgang is a miniature, painted about the year 1100 in the celebrated Evangeliary of St. Emmeram, now in the library of the castle cathedral at Cracow. A fine modern picture by Schwind is in the Schak Gallery at Munich. 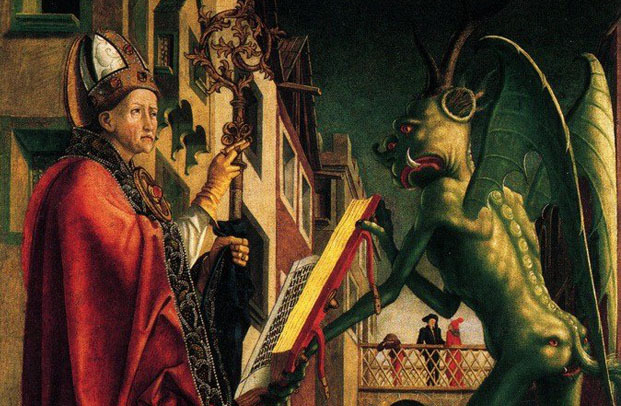 This painting represents the legend of Wolfgang forcing the devil to help him to build a church. In other paintings he is generally depicted in episcopal dress, an axe in the right hand and the crozier in the left, or as a hermit in the wilderness being discovered by a hunter. The axe refers to an event in the life of the saint. After having selected a solitary spot in the wilderness, he prayed and then threw his axe into the thicket; the spot on which the axe fell he regarded as the place where God intended he should build his cell. This axe is still shown in the little market town of St. Wolfgang which sprang up on the spot of the old cell. At the request of the Abbey of St. Emmeram, the life of St. Wolfgang was written by Othlo, a Benedictine monk of St. Emmeram about 1050. This life is especially important for the early medieval history both of the Church and of civilization in Bavaria and Austria, and it forms the basis of all later accounts of the saint. The oldest and best manuscript of this "Life" is in the library of the Abbey of Maria Einsiedeln in Switzerland (manuscript No. 322), and has been printed with critical notes in "Mon. Germ. His. : Script. ", IV, 524-542. It has also been printed in, "Acta SS. ", II November, (Brussels, 1894), 529-537; "Acta SS. O. S. Ben. ", V, 812-833; and in P.L., CXLVI, 395-422.